We have a number of suggestions that can help you maintain the look of your car. In today's world it is more and more difficult to maintain your car in like-new condition. With the effects from sunlight, UV radiation, acid rain, salt, dirt, and air pollution, we recommend that you wash your car every week and wax it at least twice a year. As much as washing your car may be a little work… Don't forget to have a little fun with it. 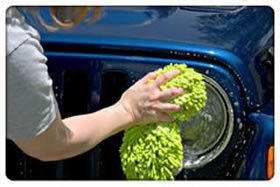 Wash off any gas, oil, or fluid spills of any kind immediately with soap and water. Do not just wipe off. Always wash off any bird droppings, tree sap, or other signs of contamination immediately. "This is very important." You may have heard that dish soap is bad for your paint or that is strips wax. We are sure that there are some dish soaps that might be tough on your car. But for the most part, dish soap is fine. When washing your car you want a wash product that will cut the grease and grim of everyday driving. For this dish soaps does fine. As far as cutting the wax off your car…sure every cleaning method out there will cut wax from your car. That is part of what the wax is designed for. The key thing here is that you wash your car, and a couple times or more a year, wax it. Under extreme use this might be worse than washing by hand. But we are living in busy times, and we do what we can. An occasional high pressure wash is usually harmless. Having the correct tire pressure in all four tires has multiple benefits. First, it will increase the lifetime of your tires, which will help save $. Second, it will help your vehicle get better gas mileage, also helping out the wallet. Third, your vehicle will perform the way it's meant to perform when turning or braking, possible helping you avoid an accident. .
Changing your oil on the recommended schedule is critical to your vehicle engine lasting as long as it should and avoiding costly mechanical repairs. With regular maintenance most modern vehicles will last much longer than most owners will want to keep them. Check your headlights, taillights, and blinkers a few times a year. This could help you avoid a costly ticket for a light you where unaware was out. Our lights and signals are very helpful tools in communicating to other drivers. When they are working properly it helps cut down on accidents.